In a rapidly changing technological society, how can we equip the next set of leaders with the tools and skills to leverage technology and innovation in addressing our nation’s widening access to justice gap? This question lead me and a group of Seattle University law students to create the newly launched ATJ Tech Fellows program. The summer fellowship program provides law students around the country with a unique opportunity to work on a range of innovative projects and initiatives aimed to improve the delivery of legal services for low-income Americans. Equal access to justice has become more of a lofty ideal than a tangible reality. Each and every day, all around the country, dedicated legal aid attorneys and staff work tirelessly to ensure that those most in need receive adequate legal counsel and proper representation in court. While these advocates make a critical difference in communities they serve, the stark reality is that they are only able to provide assistance to around 20 percent of the legal needs of low-income Americans. Leaving the 80 percent to navigate their complex legal situations on their own in resolving their legal problems. This is unacceptable for a nation that prides itself on due process and equal justice before the law. While leaders in the civil legal aid sector are responding creatively to expand their capacity to serve more people. Designing and implementing innovative solutions through the use of technology to improve the delivery of legal services for low-income Americans. It has become ever apparent that the innovation needed to fully address our nation’s staggering legal accessibility gap will require a more disruptive and transformative change. The ripe need for disruption was the impetus for creating the ATJ Tech Fellows programs. By creating a pipeline of future lawyers who are trained with the skills and competencies required in an increasingly technological society, we can accelerate the pace of future innovations in our justice system and gradually reduce those barriers standing in the way of equal access to justice for all. The diverse group of fellows will be immersed in a variety of projects and initiatives including drafting online plain language legal forms, developing online triage systems, working with automated document assembly tools, creating educational materials for self represented litigants and more. Fellows will be connected in a virtual cohort, while receiving webinar trainings and mentorship. Each fellow will receive a $4000 stipend to help defray the living expenses of the 400-hour summer commitment. 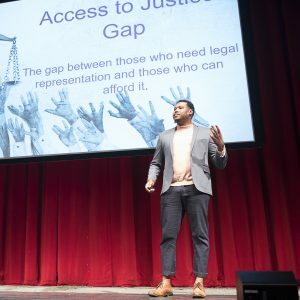 Fellows will be paired with legal services organizations around the country including, The Northwest Justice Project, Alaska Legal Services Corp., New Mexico Legal Aid, Illinois Legal Aid Online, and the Legal Aid Society of Hawaii. Furthermore, the program has recruited some of the nation’s leading experts in legal technology to guest lecture the training curriculum for our fellows. Some of the guest lecturers include, John Mayer, Executive Director of the Center for Computer-Assisted Legal Instruction (CALI) and Glenn Rawdon, Program Counsel for Technology with the Legal Services Corporation. Applications for fellowship program will open December 15th. ATJ Tech Fellows will gain access to the organizations and professionals that are on the forefront of implementing this transformative change to improve the delivery of legal services and access to justice. The fellows will be well equipped to become agile legal innovators themselves, ready to contribute to the changing landscape of legal services in making access to justice a tangible reality.